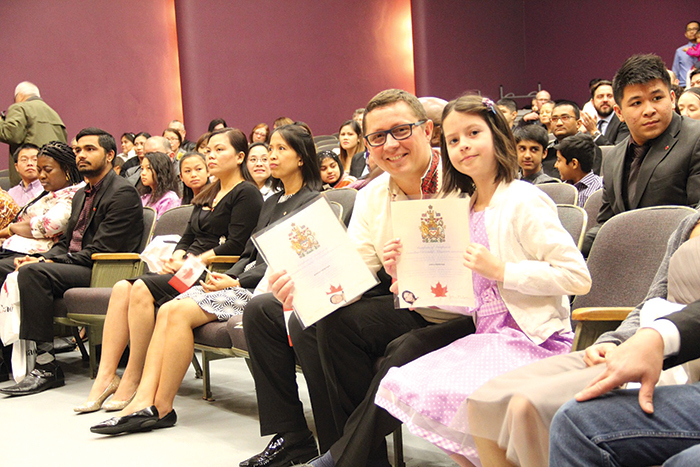 Roman Chernykh and his daughter Anna at the Canadian citizenship ceremony in Regina. A recent Canadian citizenship ceremony was a dream come true for Moosomin’s Roman Chernykh, who grew up in Ukraine. “There’s a long story around why I decided to move to Canada,” said Chernykh. “I used to work on the cruise ships, and Canada was one of the ports of call we used to sell to, from New York to Halifax and St. John’s. I fell in love with Canada, I love everything about Canada, and of course, serving the Canadian customers made me understand the Canadian culture when I worked on the ships. Chernykh grew up in Ukraine when it was still a part of the Soviet Union. “While I was growing up, it was the communism time, it was all about freedom, and your freedom was eliminated. You couldn’t speak or say what you wanted out loud. That’s just not the right way to live your life. According to Chernykh, he decided to become a Canadian citizen so that he could completely be a part of Canadian society. “I had no choice when it came to becoming a Canadian citizen. I want to be part of this country, I want to contribute to this country, I want to live with the mind of a Canadian. Canada is basically made up of immigrants, and they all have something in common. That’s Canada, to make this country strong and make it grow. That’s why I want to be part of these people, I want to be Canadian. According to Chernykh, the Canadian Prairies are similar to Ukraine in some ways. Chernykh received his Canadian citizenship at the same time as his daughter, and his wife and son should receive their citizenship later this year. Chernykh says that he does not know what would have happened if he had stayed in Ukraine and not taken the job working on the cruise ships. “I was actually working as a carpenter helping my father in Ukraine and a friend of mine came and asked if I wanted to work on the cruise ship. I was about 18 and everybody went to the army and I went to work on the cruise ship. They were looking for anybody who wanted to work on the cruise ship, so they gave me a call and I tried to explain that I didn’t even speak English. “But they said that it was no problem and all I had to do was send my passport. Two days later I was working on the cruise ship. I fell in love with it, even just serving food. As long as you make people happy you do something, and that’s how I fell in love with the hospitality business.” Roman now manages the Motel 6 in Moosomin. “I was looking for something to help my parents to change their lifestyle and that’s why I brought my brother here. He’s older than me and he said, ‘if not for you, we’ll all be stuck. We don’t know what will happen.’ It just pushed me to go forward. Now that he has his citizenship, Roman’s long-term goal is to own his own business and contribute to the community that way. He also hopes to go back home as a Canadian election observer to help the fledging democracy in Ukraine develop. Roman says he feels both fortunate and proud to be a Canadian citizen.